Death and cakes in Nyack. It was a double pleasure to head off to Nyack, New York on a sunny August afternoon; first, I would be able to attend my third Death Cafe, and second I would visit Dying To Bloom, Kerry Potter-Kotecki's "Natural Burial Boutique," the only shop I know of that offers the chance to browse through and purchase objects of use or interest around green burial. I met Kerry at the National Home Funeral Alliance conference last September, where any image I had of a burial shopkeeper was pleasantly turned out. The common thread between us, as between everyone who reads this blog, is our interest in green burial and green funerals. We already knew each other through social media, and Kerry carries copies of The Natural Burial Cemetery Guide on her shop shelves. In her element she shone. Her success was obvious in the number of guests--two dozen men and women crowded her picturesque shop to talk death--and in the media representatives on hand. Members of WRCR AM radio, a representative from Oprah, and a summer intern for Science Friday came to gather ideas for stories and to support Kerry. Kerry opened her shop "because I am passionate about supporting Green Burial. We need to take an objective view of our current practices and consider what is best for our environment and our soul. To me the answer is simple - return to nature. "The name Dying To Bloom started with a radio show I hosted to promote conversations about death and funeral/burial choices. Its dual meaning is literally dying to bloom as in natural burial, and as a symbol for taking advantage of the opportunities you have in life and to blossom before you die." Kerry grew up in Rockland County, a triangular-shaped designation that borders New Jersey and a long stretch of the Hudson. Nyack is on the western bank of the river, near the Tappan Zee Bridge. I know more about the eastern side of the bridge, which is where Sleepy Hollow Cemetery has Riverview Natural Burial Grounds. Nyack is built on the cliffs that line the western bank. "On a local level my shop just had to be in Nyack. it's an artsy, open-minded town with a creative vibe. There are artist studios, yoga studios, cafes, theaters and now a Natural Burial Boutique." Sooo--why a Death Cafe? As deathcafe.com says, "At a Death Cafe people drink tea, eat cake and discuss death. Our aim is to increase awareness of death to help people make the most of their (finite) lives." "I was actually slightly hesitant about holding my first Death Cafe because I did not want to frighten people away from my business. Ironically that is also why I decided I should host Death Cafes--they were started to alleviate fear and unease in discussions on death. So far each meeting has been unique, respectful and inspiring!" 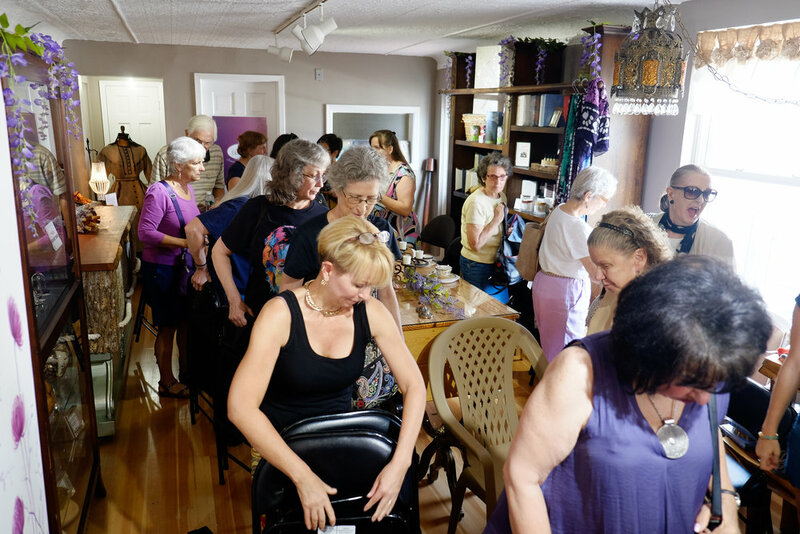 This was the seventh Death Cafe at Dying To Bloom and most people came wanting to talk about death in the crowded circle around caskets and candles. Each Death Cafe takes on the spirit and meaning of the people who happen to gather for that particular day, and a number of cancer survivors set an urgent, determined tone to the need to address after death care. Coupled with that were several young women whose eagerness wasn't colored by sadness. One of the questions that came up was how to get young people interested in natural burial, not always easy to do. Kerry's commitment to green burial goes beyond her shop to dreams of finding land in Rockland County for a green burial cemetery. She opened the Green Cemetery Fund through the Rockland Community Foundation to collect tax deductible donations. "Rockland has a large senior population. We are only 40 minutes from Manhattan and a cemetery here could serve the Tri-State area." On Kerry's counter, presided over by friends and family, including her daughter, sits a box inviting people to contribute to her dream. If you are interested in helping, go to http://www.rocklandgives.org/donationspage.html. The Green Cemetery Fund is listed there. Newer PostMy father gets a gravestone. Older Post(Burr)ied in the Maine woods.